The PCE-G1A thermo hygrometer with a large display is a fixed device to measure both relative humidity and temperature. 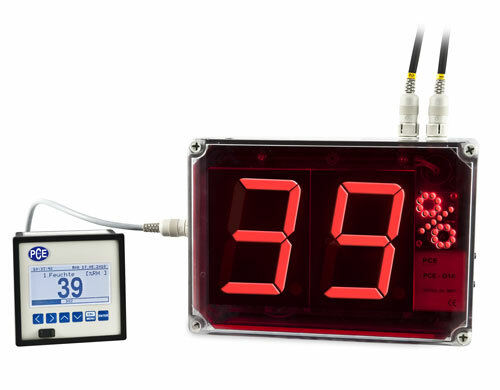 The PCE-G1A thermo hygrometer has a large 7-segment LED display with a figure height of 100 mm so measurement values can be seen from a distance of up to 50m. The PCE-G1A thermo hygrometer comes with IP 54 protection and can be wall-mounted. Both relative humidity and temperature are displayed alternately every 5 seconds. The sensors are connected to the display through 1m long cables. This enables you to measure relative humidity and temperature when sensors and display are in different places. 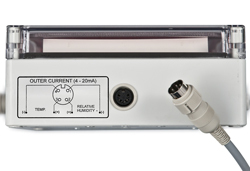 The PCE-G1A thermo hygrometer also has an analog output of 4-20 mA. The two channel analog output converts relative humidity and temperature values into a 4-20 mA signal before displaying them. Measurements can be recorded, controlled and regulated by means of the analog output. Sensors come calibrated from the manufacturer. However, an optional ISO calibration and certification can be ordered separately. Here, you will find another thermo hygrometer model with a large display but without an analog output. This link shows an overview of all thermo hygrometers we have available to suit your needs. The PCE-G1A thermo hygrometer has a wide field of application thanks to its two channels with analog output of 4-20 mA. For companies that wish to include the thermo hygrometer in their set of internal tools or for annual recalibrations (in cases when the calibrator is not used). The ISO calibration includes a laboratory calibration and a document with all the measurement values and details of the owner of the device. 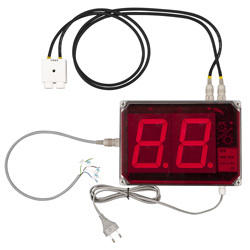 A data logger can be connected to the thermo hygrometer to store measured values.